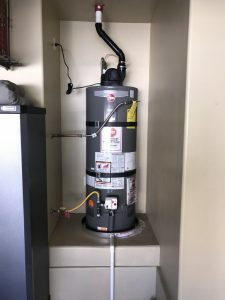 Get A FREE Water Heater Replacement Quote! When your home hot water heaters have problems, you can turn to Star 5 Plumbing. 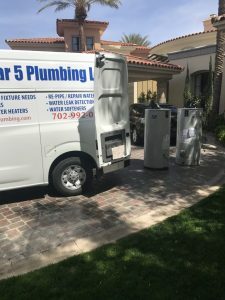 We have provided Plumbing for water heaters in Las Vegas For Over 15 years. Licensed, and insured plumbing for water heaters. Installation for gas water heaters, and electric water heaters with guaranteed manufacturer and factory parts. Call 702-992-0203 for up-front pricing with options that are tailored for your home and family. Our technician will help you assess your home and family’s water heater needs. You might only need a repair, maybe all you need is light maintenance. We will never over complicate your issues and always try to find the best solution to fit your needs. What are you waiting for? Call Star 5 Plumbing at 702-992-0203 or book an appointment online. For quality repairs to your water heater, Star 5 Plumbing can help! We repair, perform maintenance, and install all models. Repairs become necessary when your hot water is not functioning as well as you’d like. Common water tank repairs include leaking tanks, no hot water or not enough hot water, and irregular bursts of hot and cold water. Faulty pressure relief valves and thermostats can be repaired, but if the tank is leaking it’s probably rusted out, which would require a new tank. Is It Time To Change Water Heaters? 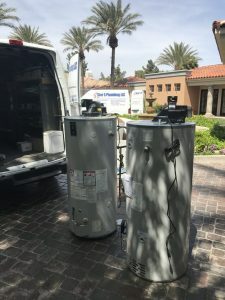 A water heater in Nevada should be replaced every 8-12 years, it really does vary from environment, to maintenance and upkeep. If you have an older model that exceeds this recommended timeframe, it may be time to start looking for a new model. Certain problems with your tank also cannot be fixed, such leaks. If the interior of the tank has rust, it’s best to replace it. Another time upgrading your water heater is wise is when your home’s needs exceed the tank’s capacity. If your home was built for a couple or small family and you have extended house guests or a larger family, your household will probably use up the hot water quicker than the tank can replenish itself. Talk to a professional at Star 5 Plumbing to help determine what size tank is best for your family. 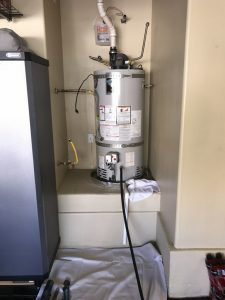 For the install of water heaters, or if you need water heater replacement, call Star 5 Plumbing today to secure your appointment with up-front water heaters pricing at 702-992-0203.